SONOSIM SUMMARY: The Rapid Ultrasound in Shock (RUSH) protocol is a valuable ultrasound examination for the evaluation of undifferentiated shock in acute care settings. In this study, emergency medicine residents at the University of Manitoba with equal introductory point-of-care ultrasound training were asked to perform and interpret RUSH protocol exams using SonoSim LiveScan® on a retrofitted training manikin. Afterwards, the same residents completed 8 hours of online didactic courses and hand-on ultrasound training, including the SonoSim® Rapid Ultrasound in Shock: Core Clinical Module, and were reassessed using SonoSim LiveScan®. After having completed the additional ultrasound training, residents showed improvement in the areas of “IVC image acquisition and interpretation, as well as interpretation for B-lines, lung sliding, cardiac apical and parasternal long axis, and DVT (p<0.05),” as well as improved comfort levels. The study indicates that the SonoSim® Rapid Ultrasound in Shock: Core Clinical Module improves emergency medicine residents’ ability to perform and interpret the RUSH protocol examination. 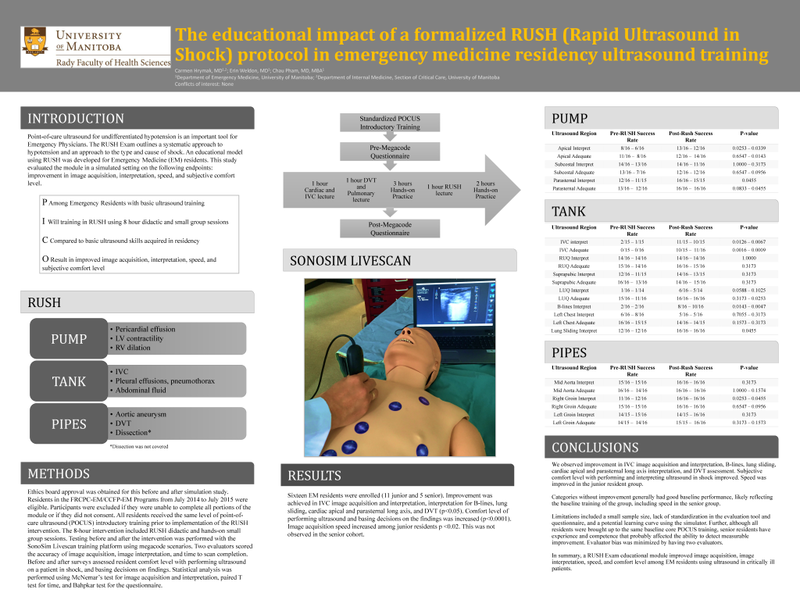 Hrymak C, Weldon E, Pham C. The educational impact of a formalized RUSH (Rapid Ultrasound in Shock) protocol in emergency medicine residency ultrasound training. Canadian Journal of Emergency Medicine. 2016 May; 18(S1):S61-S62. Point of care ultrasound for assessment of undifferentiated hypotension and shock is part of the clinical scope of Emergency Physicians in Canada. The RUSH Exam outlines a systematic approach to these patients. A RUSH Exam educational model using didactic and hands on practice was developed and implemented for Emergency Medicine (EM) residents. This study evaluated the effectiveness of the module in a simulated setting on the following endpoints: improvement in image acquisition, interpretation, speed, and subjective comfort level, among EM residents with basic ultrasound training. Approval was received from the institutional health research ethics board for this before and after simulation study. Residents in the -EM Program or CCFP-EM Program from July 2014 to July 2015 were eligible to consent. Participants were excluded if they were unable to complete all portions. All residents were educated to the same level of introductory ultrasound training based on the curriculum in place at our institution. The 8-hour intervention included RUSH didactic and hands on small group sessions. Testing before and after the intervention was performed with the SonoSim Livescan® training platform. Two evaluators scored each resident on the accuracy of image acquisition, image interpretation, and time to scan completion. A before and after survey assessed resident comfort level with performing ultrasound on an emergency patient in shock, and basing decisions on ultrasound findings. Statistical analysis was performed using McNemar’s test for image acquisition and interpretation, a paired T test for time, and the Bahpkar test for the questionnaire. 16 EM residents including 11 senior residents and 5 junior residents were enrolled. Improvement was achieved in the categories of IVC image acquisition and interpretation, as well as interpretation for B-lines, lung sliding, cardiac apical and parasternal long axis, and DVT (p<0.05). Subjective comfort level of performing ultrasound in shock and basing decisions on the findings was increased (p<0.0001). Among junior residents, there was an increased speed of image acquisition. With the introduction of the RUSH Exam educational module, EM residents showed improved image acquisition, image interpretation, speed, and comfort level when using ultrasound in critically ill patients. To read the article, visit The Canadian Journal of Emergency Medicine Website.